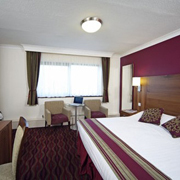 The George Washington Hotel Golf & Spa, Washington, Tyne and Wear is popular with both corporate and leisure guests. This purpose-built hotel boasts an 18-hole championship golf course, 7-hole par 3 golf course and a floodlit driving range. Bedrooms, including a number of suites, are spacious and comfortably equipped. Public areas include extensive conference facilities, a business centre, a choice of restaurants and a lounge bar. The hotel's leisure facilities include an indoor pool, gym, sauna, solarium and jacuzzi. The hotel is undergoing a major refurbishment. We now boast luxury rooms with whirlpools, four-posters plus many completely refurbished standard bedrooms and other fantastic facilities. Ideally placed to visit the scenic countryside of Northumberland and Durham, with the cities of Newcastle upon Tyne and Sunderland only a 10-minute drive away.